This is the umpteenth book by Syliva Browne I've read, each one equally captivating. What Ms. Browne has experienced has the potential to convince and influence many people on the fence about religion and spirituality, reincarnation, the Afterlife, and so much more. It's best to read her work with a completely open mind. For me, it's always been trying to fathom the universe, what's out there, how far does it stretch, what's beyond the furtherest beyond, how did God come into existence (i.o.w. who made God? ), and things like this I find confusing and exhausting just thinking about them. Much of Sylvia's knowledge and information comes from her spirit guide, Francine. I wish we all knew who our spirit guides were - life would be a lot easier sometimes. Ms. Browne talks about the beginning of everything on earth (the seven schematics of creation) and while written in easy-to-understand language, it's still hard to digest. I get what she's saying but when you look at instances where there is no soul mate (just one aspect and perfectly okay, incidentally), I wonder why we would choose (my ongoing confusion) this for ourselves this time around. Ms. Browne also describes the Underworld (it starts making sense how we think (imagine) of these things), the seven levels of life on earth, the seven levels of the Other Side, and more. There is so much more to life (and living) than just being born, living and growing, and then dying. I'd like to explore more but I sometimes think it's too big for my brain. I had a lightbulb moment while reading about teenagers in 'The Fourth Level" chapter about homesexuality (a perfect answer! ), and about fears and past-life recall. It's taken so long to find this out! I've always thought Hell was here on earth and that to be spiritually aware was good enough for God. I don't like organized religion as such, much less fanatics (of any sort) - there are too many hippocrites. 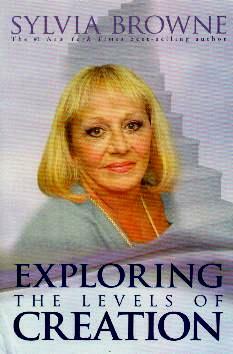 Visit Sylvia Browne's website at www.Sylvia.org for more information. Conclusion - It all makes so much sense. Invaluable knowledge from Sylvia Browne. Other reviews of Sylvia Browne's books.